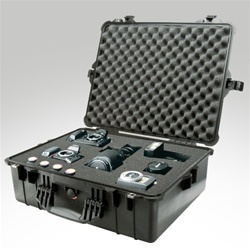 UFOStop UFO Hunting Equipment - Pelican Gear Case With Foam 23.25" x 20.75" x 9"
Pelican Gear Case With Foam 23.25" x 20.75" x 9"
This case had just arrived today and all I can say is that I'm very satisfied with the product. Not only could we fit the majority of our equipment into it (dvr system with four cameras, cell sensor, an ir light, and several other stuff) but we have enough room to fit at least one more dvr! What makes this product really unique isn't only it's durable outing but that the inside foam is pick and pluck so we could easily remove the foam to fit in our gear snuggly without destroying our cutting the foam so we could re-use it at another time!